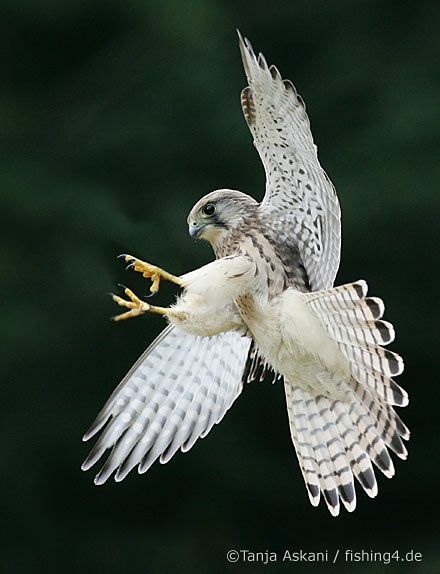 Remember how I said a few posts ago that you don’t want to mess with a female gyrfalcon? Yeah, well one of the female falcons here is absolutely psychotic. When the Peregrine Fund field technicians were doing an aerial survey, she actually flew out and dive-bombed the helicopter. They had to do some quick aerial maneuvers to avoid chopping her to ribbons in the helicopter blades, and they came back looking a little green. The Peregrine Fund is the organization that I’m working with out here in Alaska. They’ve been kind enough to let me onto their ongoing project studying gyrfalcons, and they’ve provided me a place to stay in a bunkhouse at their basecamp. For decades, they have been dedicated to raptor conservation and research on birds of prey on an international scale – and they got their start in one of the first environmental battles ever fought. I’m sure most of you know about the fight to ban DDT. It was a chemical used to help keep soldiers from developing insect-borne diseases during World War II, and was widely used by the 1950s as an insecticide. It was bad for raptors, for fish, and for people. We’re usually taught in school that Rachel Carson’s Silent Spring was what finally managed to get DDT banned, but that’s not actually true. It was really a joint effort between three organizations: the government-run Patuxent Wildlife Research Center, the newly created Environmental Defense Fund, and the nascent Peregrine Fund. The three groups essentially split the issue between them. Patuxent spent most of its time working to prove in a controlled setting that DDT was a problem, while the EDF fought its battles in the courts and created the field of environmental law. The Peregrine Fund, made up of a loose organization of falconers, focused on captive breeding of peregrine falcons to keep the bird from going extinct. They also collaborated with Patuxent, as the research center had to figure out how to breed American kestrels in captivity for use in its DDT trials. The Peregrine Fund had the knowledge required to encourage the birds to reproduce, and together the two groups definitively showed DDT to be a harmful substance. Through the efforts of all three, the peregrine falcon is now a common bird in the continental United States. The success of the effort led The Peregrine Fund to consider expanding its view, and it began conservation work on raptors internationally. Today, they are responsible for the reintroduction of the California condor, the resurgence of the bald eagle, and the reversal of the Indian vulture crisis. They conduct scientific research and work with local communities to teach them how to work with their own raptors, allowing for expansions in conservation efforts even after a project ends. Next time, we talk about ptarmigan! Probably. Unless I get sidetracked and talk about something else. That’s definitely possible.